What To Do If You Find Yourself With Baby Rabbits. If your rabbit has babies (kits), the first thing you should do is to remove the male rabbit from the cage. The male rabbit may not hurt the baby rabbits, but he can and may impregnate the momma bunny and any female bunnies as soon as they mature. If you do not want any more rabbits, I would suggest you have the male and female rabbits neutered and spayed. This way you will be sure they will not have any more babies and altered rabbits have better temperaments. The momma bunny will only feed her young once or twice a day, usually at dawn and at dusk, when the momma is feeling safe. If she thinks something or someone will endanger her babies, she will not come around them. Many people think that baby rabbits are abandoned because the momma is not with them. By nature, the momma is nearby watching to make sure no danger comes to her offspring. The babies do not have a scent that would attract other animals to them, so the momma stays away most of the time. So how can you tell if the momma rabbit really has abandoned her babies? If the baby rabbits are scattered, cold, and their bellies are sunken in and they are wrinkled from dehydration. These would be good indications that the momma bunny was scared off or worse. If the momma bunny is still there, she may just need a proper nesting box for her and her babies. A nesting box will give her some security she needs to feel safe while she tends to her babies. If your momma bunny is not lactating or has not attempted to pull fur to make a nest then you will need to call a rabbit veterinarian immediately. If you wait more than 48 hours, the drug used to stimulate the milk glands will work. That drug is called Oxytocin. It helps momma bunnies to produce milk so they may nurse their young. If you think the momma bunny is hurting the baby rabbits, there are a few things to consider. If the mom’s nails have never been clipped, she may accidentally injure her babies, maybe her nesting box is not the correct size, or she may be stressed by too much activity around her. If she is housed outside, she could be stressed by the wild animals that may come around at night. Young moms under six months old may not understand what is happening to them and you should seek veterinary help. Also, if the babies are large the mom may have difficulties with the delivery. The momma bunny may hurt her offspring trying to give birth. But it may be difficult for her if the baby is too large for her birth canal. In such cases, the mom and babies lives are in danger and immediate veterinary help is needed. If the momma bunny had died or will not nurse her babies you can try to hand feed the babies. However, hand feeding baby rabbits have not been very successful. There is not a milk replacement that is 100% adaptable for rabbits. Some people have tried given the babies KMR, kitten mil replacer, or goat’s milk. Never give a rabbit cow’s milk. If the baby is old enough, 3 weeks old, then water and timothy and alfalfa hays are best. No carrots or fruits until they are older. The best baby formula is 75% Zoologic Milk Matrix 30-55, 25% Zoologic Milk Matrix 42-25 or a good alternative is Esbilac Goat’s milk formula. Often wildlife rehabilitators, veterinarians and breeders have used a formula using two parts KMR (kitten milk replacer) or Esbilac (puppy milk replacer) with 1 part goat’s milk, heavy whippy cream or MultiMilk. They also recommend adding a pinch of Lactobacillus acidophilus to help grow gut flora. Normally, the baby would get these healthy bacteria from their momma’s milk. There is a potential disease that a baby rabbit can get when hand fed. It is called mucoid enteritis or mucoid enteropathy and it can be fatal to the baby. It usually occurs when the babies are removed from their mom before 8 weeks of age. The signs are; severe diarrhea, refusal to eat, and jelly-like stool that may contain blood or mucous. The baby will become dehydrated, even though he will drink a lot. There will be a sloshy sound in his belly, rumbling noises in his gut; he may grind his teeth, indicating he’s in pain because of the built-up gas in his belly. Sometimes he may strain when trying to relieve himself and he may have a loss of bladder control. Some breeders have used Simethicome infant drops to eliminate the gas problem. The drops can be found at any drug store. To treat the mucoid enteropathy, which is a harmful bacteria in the rabbit’s intestinal tract and it needs to be removed while leaving the good bacteria in the digestive tract. A good treatment is Neomycin Sulfate, which you can find under different brand names. They are Biosol, which is marketed for pigs and goats and is the most common form of this medication. Pet stores carry a brand called Dri-Tail. The Biosol is a 200mg per cc of neomycin sulfate and the Dri-Tail is a diluted formula. You will also need to feed your bunny some yogurt, unflavored, to promote the growth of the good bacteria. Instead of yogurt, BeneBac can be used. Fox Valley Animal Nutrition Inc. carries a product called “Formula L A 200” which is a viable lactobacillus acidophilus which acts the same way as BeneBac. Fox Valley Nutrition's phone number is 800-679-4666, call them if you have any questions. To battle the loss of nutrients and electrolytes for the dehydration and diarrhea, stop feeding the rabbit his pellet food and only feed him grass hay and oats. To supplement their feeding, mix one half Pedialyte and water and have your rabbit drink as much as possible. If he will not drink on his own, you will need to use a syringe. Also, feed your rabbit NutriCal to give it some immediate palatable nutrition. NutriCal is marked for dogs and cats. If your rabbit is showing signs of listlessness get him to a vet immediately. The sooner you treat the dehydration problem the better. When baby rabbits are ten days old they will open their eyes. Then they will start to eat their mom’s cecotropes (night feces) that provide essential nutrients to them. It is important to feed hand-fed rabbits with adult cecotropes after their eyes are open. It’s natural for the babies to eat cecotropes, so there should not be a problem. However, if they don’t start to eat on their own, add two or three of the droppings to their formula to one of their feedings of a few days. As they start to eat adult food, check their droppings. When you see signs of soft stool, re-introduce cecotropes to them. 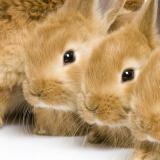 If you have any questions regarding baby rabbits, call a rabbit veterinarian as soon as possible.